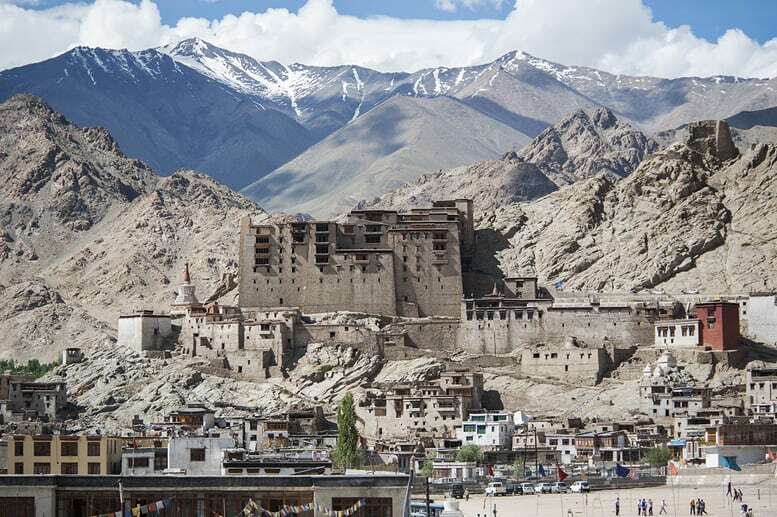 Ladakh lies in far north India, in the heart of the Himalaya. The name of the region means ‘land of high passes’, as it’s completely locked by mountains on all sides, and so it can only be reached by air, or via a grueling trip across passes over 5000 meters over sea level. 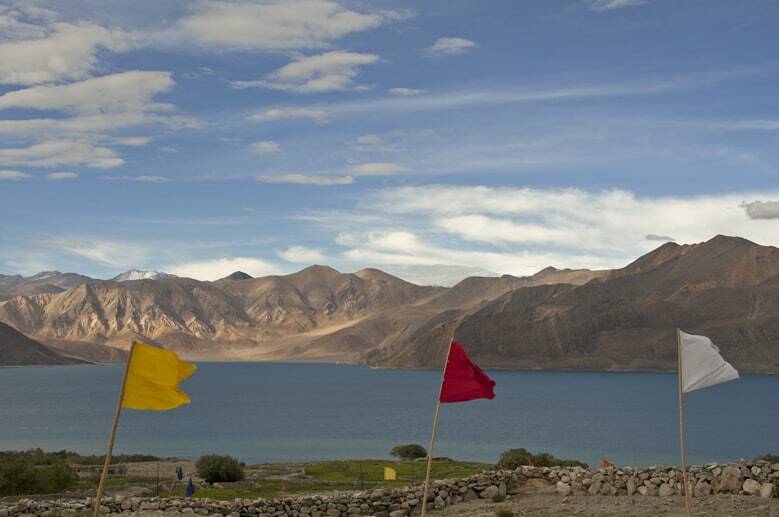 Ladakh occupies the western half of the Tibetan plateau; its history, language and culture are closely related to Tibet. As such, Ladakh is one of the best places in the world to experience and get to know Tibetan culture, especially in summer when beautiful, colorful festivals take place in monasteries. 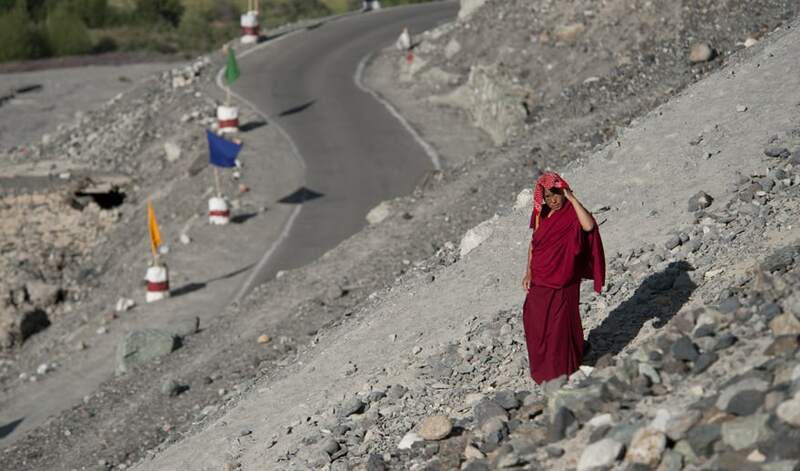 However, the future of Ladakh may be bleak. Ladakh is a high-altitude desert, with only 100 mm of rainfall every year. Global warming brought increased rainfall in the region – during the night of August 6th 2010, a year’s worth of rainfall fell in under an hour, triggering mudslides and flash floods that killed over 300 people. We were in Ladakh that night. This photo story is a tribute to this beautiful land, and to all people that lost their life. Leh can be reached by road from Manali or Srinagar, the capital of the Indian state of Jammu and Kashmir, to which Ladakh also belongs. We opted to travel by local bus from Manali, a 477 km journey that took two days. We travelled across a moonlike high-altitude landscape, crossing two high passes at over 5000 meters of altitude. The picture above shows a local woman sipping tea at a rest stop, after spending the night in a parachute tent with over 20 other people – including us. 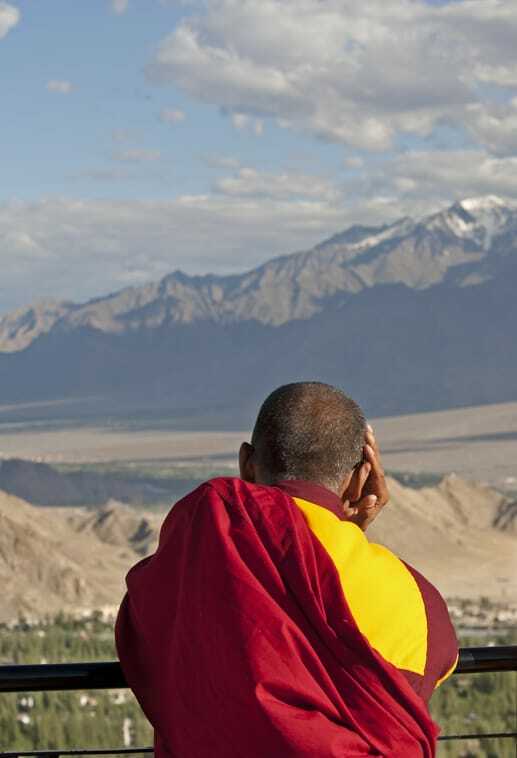 A Buddhist monk at Shanti Stupa, located in the mountains a short walk away from the Upper Changspa district in Leh. When the photo was taken, several monks from all over India were in Ladakh to see His Holiness the Dalai Lama, who was giving a lecture in the Nubra Valley, a remote valley of Ladakh. Buddhism is the main religion in Ladakh, even though several Kashmiri residents are practicing Muslims and there’s a big mosque in Leh. 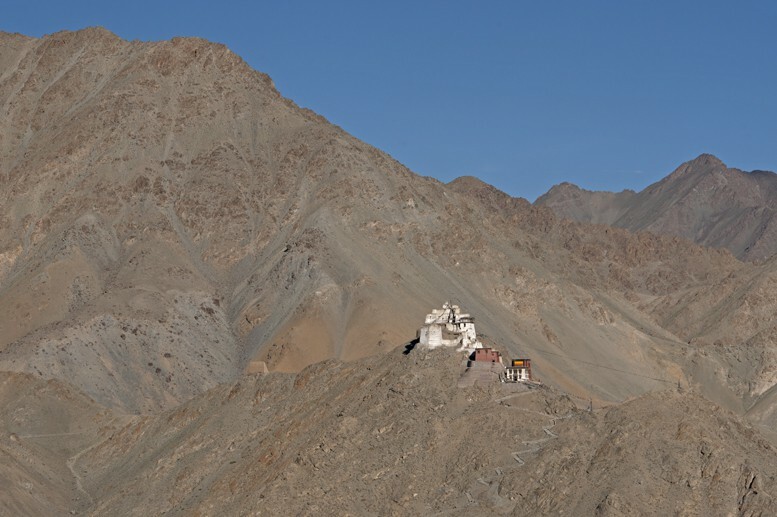 The mountains are dotted with monasteries that can only be reached on foot, like this one. Tibetan prayer flags and another mountain monastery in Leh. 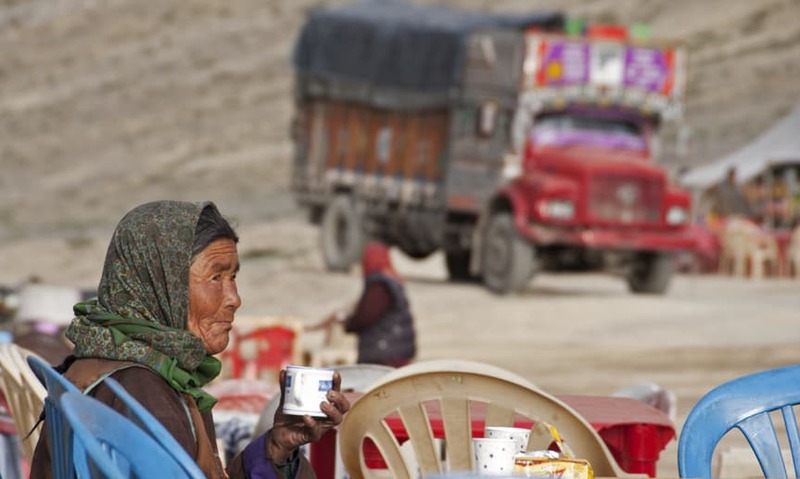 The Tibetan culture is still alive in Ladakh, even though the central Jammu and Kashmir government made Urdu compulsory in schools, and many young people in the region cannot speak Ladakhi nor Tibetan. 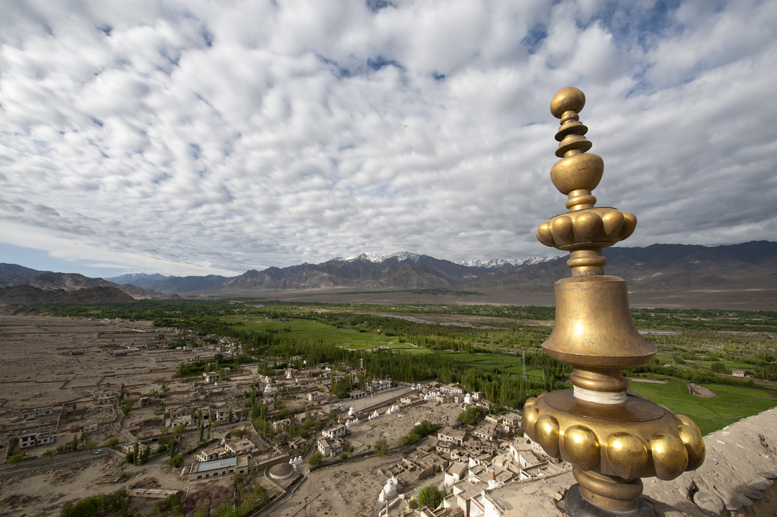 This is a view from Thiksey monastery, the largest monastery in central Ladakh, inspired by the Potala Palace in Lhasa. 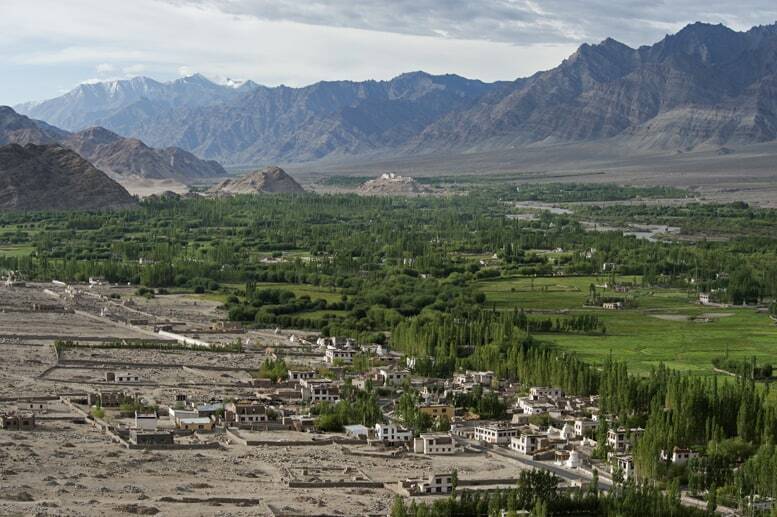 It’s 19 kilometers away from Leh and when we visited it was eerily quiet, as all monks had gone to the Nubra Valley to see the Dalai Lama. 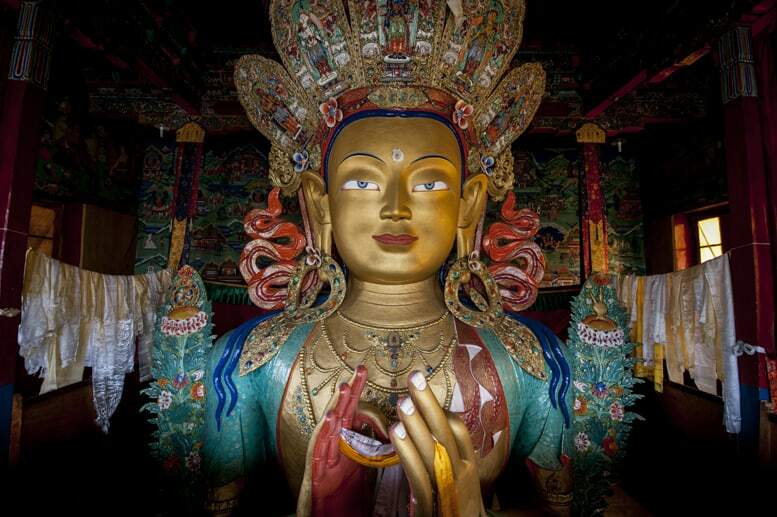 The statue of Maitreya, the future Buddha, at Thiksey monastery. According to Buddhist sacred scriptures, Maitreya is a bodhisattva, an enlightened being who will appear on Earth and achieve enlightenment, and then continue Buddha’s teachings. This prophecy is found in all major schools of Buddhism. The iconography of Maitreya is very common all around Ladakh, and statues like this are everywhere – in squares, big monasteries and tiny ones lost in the mountains. Another view from the top of Thiksey over the Himalaya and the surrounding landscape. The Indus river has its source in Ladakh, and it flows in the middle of the green strip you see at the right of the picture – notice the contrast with the arid, desert landscape beyond. A view of Leh from a distance, travelling north. 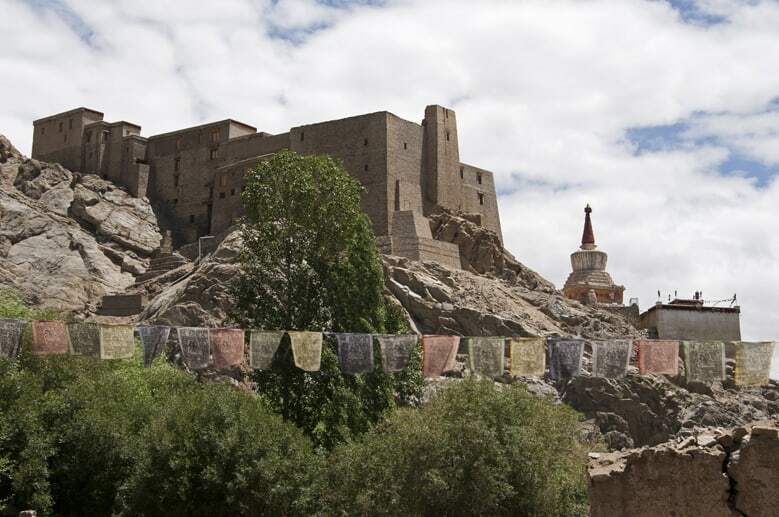 The cityscape is dominated by the ruined Leh Palace, a former royal palace built in the seventeenth century on the model of the Potala Palace in Lhasa, just like Thiksey monastery was. The Palace was recently opened to the public and offers stunning views over the valley. Prayer flags over Pangong Lake, a salted lake that is 134 kilometers long, and extends beyond the border between India and Tibet. It is 4250 meters above sea level. We travelled to Pangong Lake on a ramshackle local bus that runs only once a fortnight, taking 12 hours to cover just over 100 kilometers. 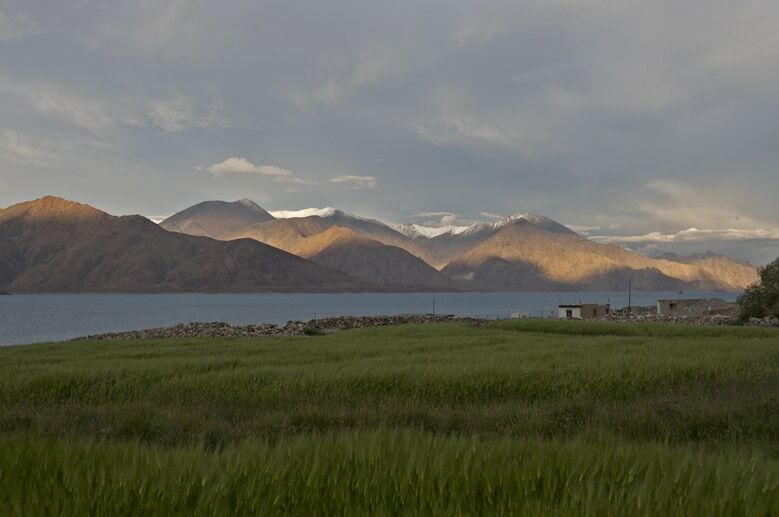 The long grass of the steppe and Pangong Lake. In Ladakh, the landscape is reminiscent of Central Asia – arid, with deserts and steppe, and two-humped Bactrian Camels roaming around. 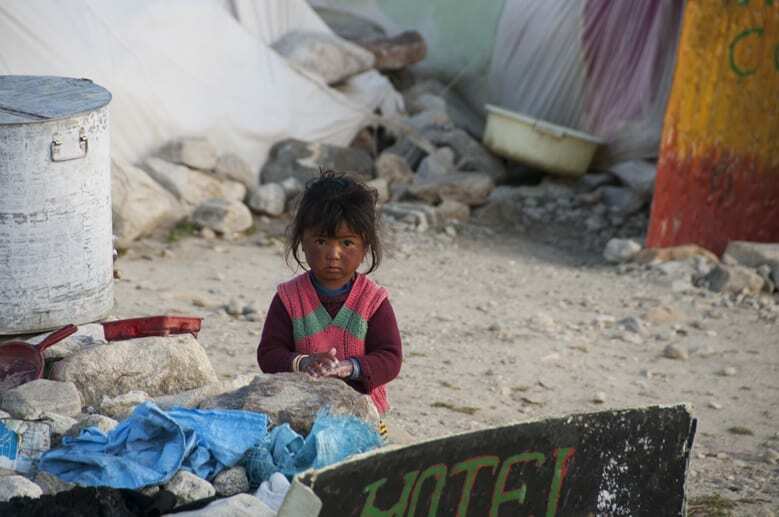 A little Tibetan girl doing her washing near Pangong Lake. The lake freezes in winter and even in summer it was bitterly cold, because of the high altitude. 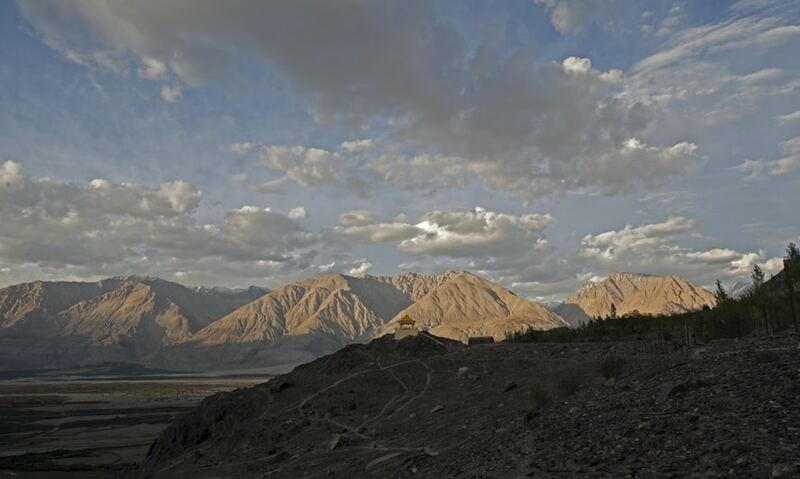 A yellow stupa in the mountains of the Nubra Valley. To reach the valley, you need to cross Khardung La, which was believed to be the world’s highest motorable pass at 5610 meters of altitude. In fact, it was recently discovered that it ‘just’ reaches 5389 meters – hence it lost the title to a Tibetan pass. 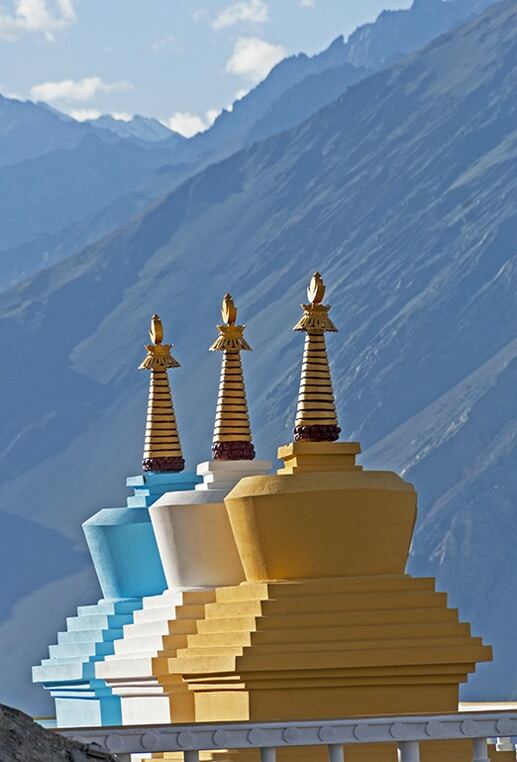 Three stupas in Diskit, bathed by the sunset light of the Nubra Valley. The hamlets of Diskit and Hunder welcomed over 10,000 tourists and pilgrims during the 2010 visit of the Dalai Lama, Finding a bed was impossible, but local families opened their homes and gardens, allowing people to camp and sleep on their couches. 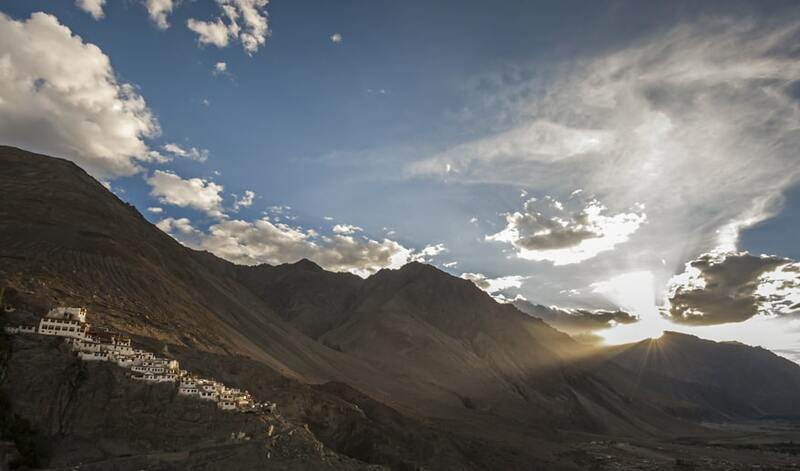 The last rays of sunset illuminate a monastery on the mountains above Diskit, in the Nubra Valley. There’s something special about the light at these altitudes. Everything seems neater and clearer, as all pollution is gone, and even the mist of lower altitude mountains is not seen. 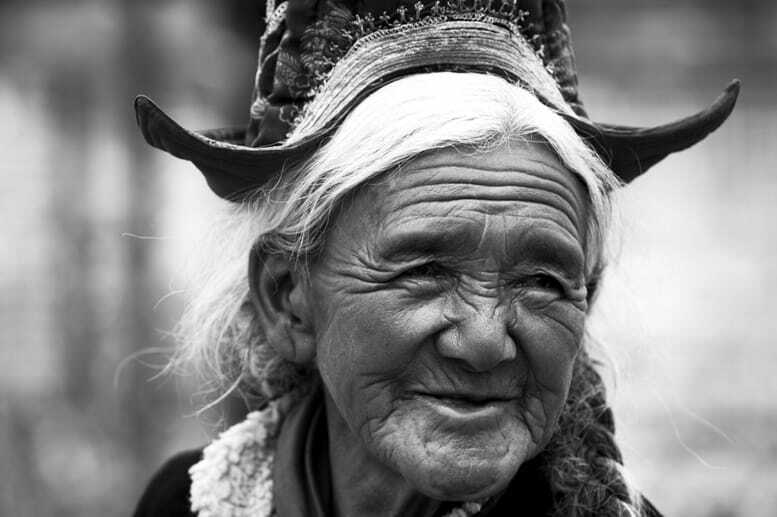 An elderly Ladakhi woman in her traditional clothes. This woman, who is probably over 80 years old, climbed over a fence to get a glimpse of the Dalai Lama, then ran after him and threw herself to her knees. His Holiness helped her up, embraced her and called her ‘sister’. This picture was taken shortly afterwards, you can still see they joy in her eyes. 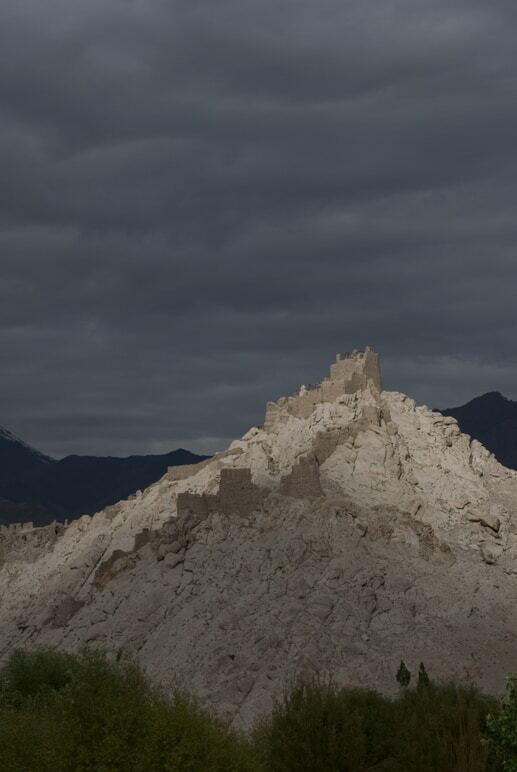 A mountain temple in the Nubra Valley under a stormy sky. 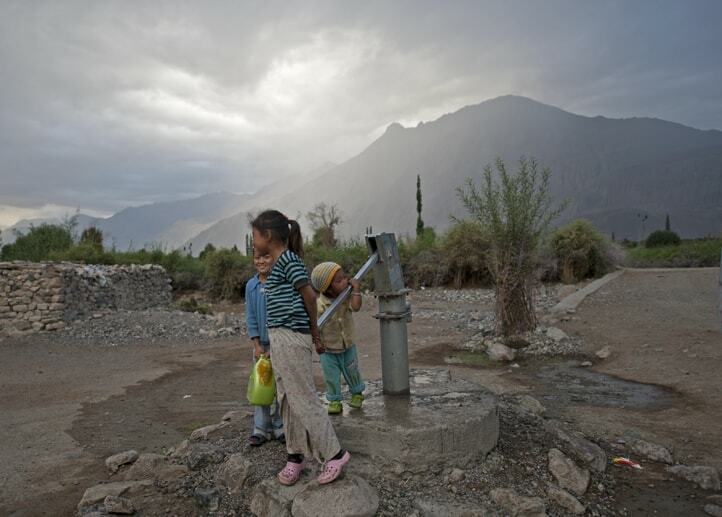 Some children we met in Ladakh had never seen rain. A few days after this picture was taken, Leh was hit by the floods. 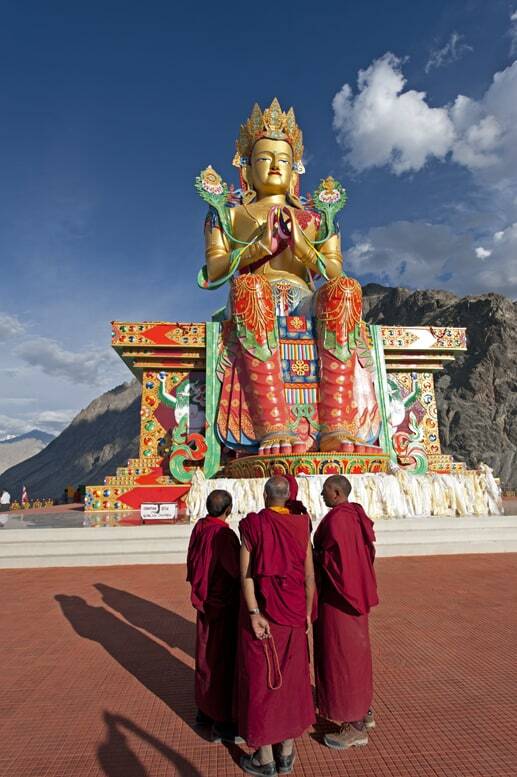 A group of monks visit the statue of Maitreya in Diskit, unveiled a few days before the Dalai Lama’s visit. 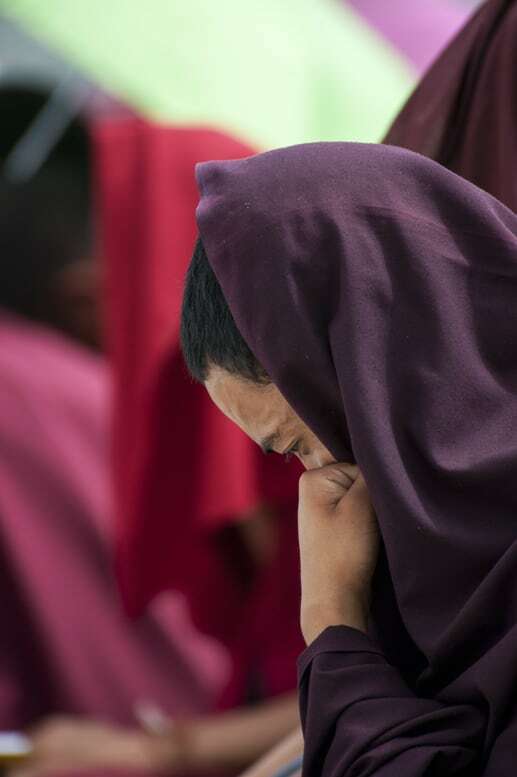 A young monk praying during the teachings of the Dalai Lama. A lone monk in the midday sun, when everyone else is sleeping, climbs to a monastery to pray before the Dalai Lama lecture in the afternoon. Margherita Ragg is a freelance writer and English teacher from Milan, Italy. She is passionate about wildlife, ecotourism and outdoor activities, and runs nature and adventure travel blog The Crowded Planet with her husband Nick Burns, an Australian travel and wildlife photographer.Margherita has an MA in Travel and Nature Writing from Bath Spa University, and was runner-up to the 2012 Guardian Travel Writer of the Year competition. 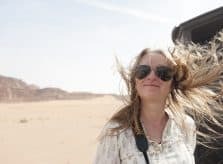 She is one of the hosts of the @WednesdayRoamers weekly Instagram competition. Her other passions (in no particular order) are rock climbing, skiing, homebrewing and her cat Tappo. Follow Margherita on Facebook, Twitter, Instagram and Pinterest.